School-based health centers can provide access to healthcare for students who may not otherwise receive care. Rural students may face barriers to accessing healthcare services including long distances to providers, lack of reliable transportation, work demands of students' parents, poverty, lack of health insurance, and the cost of healthcare. School-based health centers often operate as a partnership between the school and a community health center, hospital, or local health department to improve the health of students, as well as the community as a whole. What role can rural schools play in improving the health of their students? What types of healthcare services can be provided in rural schools? What programs are available to provide children with healthy and affordable meals? What are strategies that rural schools can use to increase the nutritional value of foods served to their students? What are strategies that rural schools can use to increase the amount of physical activity their students get during the school day? What health education and prevention programs can be implemented in a rural school to improve students' knowledge of how to maintain their own health? How can schools promote population health within their communities? How are schools addressing the shortage of health professionals and getting students interested in health careers? What funding programs are available to support school-based health services? How can rural schools work to address and prevent Adverse Childhood Experiences (ACEs)? Schools play a significant role in promoting the health and safety of students. Ideally, rural schools will strive to provide a healthy physical environment for students to learn, provide nutritious meals, and encourage physical activity. One strategy some rural schools have implemented is the creation of a School Health Advisory Council or a School Wellness Committee, which works to promote a healthy and safe school environment for students and staff. This council often has input from students, parents, teachers, and school administrators to identify barriers and solutions to improving the health and well-being of students. The CDC and Association for Supervision and Curriculum Development (ASCD) provide more information about the Whole School, Whole Community, Whole Child model. For other examples of evidence-based programs schools can implement, see How Can Rural Schools Address Obesity? in RHIhub's Rural Obesity Prevention Toolkit. Schools can serve as a location for providing students with counseling and behavioral health services. According to a CDC report, the percentage of children with diagnosed mental, behavioral, and developmental disorder (MBDD) is consistently higher in rural areas. For illustration, 18.6% of children 2-8 living in small rural areas have a reported MBDD diagnosis compared to 15.2% of children with a reported MBDD diagnosis of same age group in urban areas. Schools are the most common location for children to receive mental health services. Access to Mental Health Services for Children in Rural Areas identifies ways in which school-based health centers can provide these services. RHIhub's Mental Health topic guide has resources on how schools can take action to prevent suicides. Oral health is another area where schools can play a role in improving children's health and helping them develop healthy habits. School-based dental programs can provide dental screenings, fluoride varnishes, dental sealants, and a variety of oral health education to students without them having to leave the school. For examples of what some rural schools have implemented, see the School-based Model section of RHIhub's Rural Oral Health Toolkit. In addition to school health promotion initiatives and policies, some rural schools are able to employ a school nurse or house a school-based health center, both of which work to directly address the health needs of students. These programs are described in the following question. In rural schools, nurses often fill multiple roles including clinician, administrator, record keeper, and grant writer. The 2015 NASN School Nurse Survey reports on a survey of school nurses in all 50 states. The majority of school nurses who responded to the survey were employed by a public school district and their position was funded by the regular education budget. Just over 30% of survey respondents worked in at least one school in a rural area. A school-based health center (SBHC) provides a variety of services to improve the overall health of students and their family members, including primary care, immunizations, health screenings, and health education. Some SBHCs provide additional services such as mental health services, vision and hearing examinations, dental services, substance abuse services, and reproductive health services. According to The Complementary Roles of the School Nurse and School Based Health Centers from the National Association of School Nurses, having a school-based health center improves students' access to healthcare services, but the center does not necessarily take the place of a school nurse. School nurses are employed by the school district and serve all students. School-based health centers, on the other hand, are usually run by a community health center or hospital, and students must enroll in the clinic to receive services. Collaboration between school nurses and health professionals at the SBHC is important for improving the well-being and education of rural students. For information about how to start a school-based health center, HRSA's School-Based Health Center Capital Program Technical Assistance website has information regarding how to apply. The School-Based Health Alliance offers Sustainability Tools to help SBHCs build a stable foundation to ensure long-term viability. Assistance to states to operate breakfast programs in schools and residential childcare programs. Nutritious low-cost or free lunches to children in schools and residential childcare programs. Reimburses schools for milk they serve to children who do not participate in other federal meal service programs. Nutritious meals and snacks for afterschool programs served in a group setting to children and teenagers. Provides funding to local sponsors who want to combine a meal program with a summer activity program for children 18 years old and younger. USDA's Tools for Schools provides subject-specific resource materials to help schools meet federal nutrition and compliance standards. Information offered includes nutrition education curricula and literature, food buying guides, obtaining local foods, enhancing school lunches, school wellness policy, and regulatory requirements. The National Farm to School Network is a movement to bring more local food into schools and to teach children about where their food comes from. The network encourages schools to purchase, prepare, and serve locally-grown items. The program also supports bringing students to local farms to teach children about the importance of nutritious food and local farming. For example, Focus on Agriculture in Rural Maine Schools (FARMS) is a farm-to-school program developed in 2008-2009 that connects children, cafeterias, local farms, and communities to promote healthy meals for more than 1,500 children. FARMS started in one school, and is now in 5 elementary schools and 1 private secondary school. This program worked with superintendents, principals, and school board members, and included school food service in the discussions to grow the program. If school land is available, planting school gardens provides an opportunity for students to be involved in growing different types of fruit and vegetables as well as learning where their food comes from. School gardens are an excellent source of nutritious items for food service staff to prepare for students and school staff members. 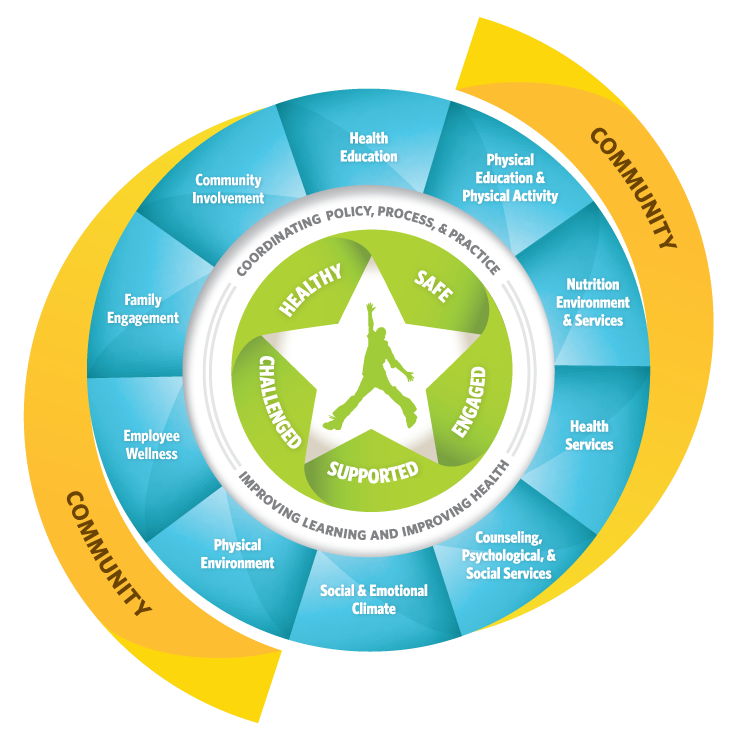 The Coordinated Approach to Child Health in the Upper Peninsula (CATCH-UP) located in rural Western Michigan's Upper Peninsula was developed to reduce the incidence of obesity and the risk of chronic disease for children aged 5-12 by increasing physical activity and healthy eating. Teachers and afterschool workers received training by health educators on the Coordinated Approach to Child Health (CATCH) model they could use in the classroom and in school health committees. CATCH-UP served more than 3,500 children in 12 independent school districts by teaching health and nutrition through the use of games, increasing exercise through equipment packs with balls, hoops, and flags, and by developing safe routes to school for walking and biking. For more examples of CATCH implementations and other strategies that rural schools can use to improve healthy food choices, RHIhub compiles rural models and innovations regarding food and hunger. Additionally, Farm to School Models are discussed in RHIhub’s Rural Food Access Toolkit with resources and program examples. Children need quality physical activity throughout their day to lead healthy lives, to learn, and to prevent obesity. A 2015 literature review of childhood and adolescent obesity indicates children aged 2-19 living in rural areas have a higher rate of obesity, and a 26% greater chance of becoming obese when compared to urban children. Increasing physical activity is a key obesity-prevention strategy. Rural schools can serve as the ideal location to promote and foster physical activities, and serve as a community resource to support afterschool physical activities. There are several model programs that address physical activity in rural schools. According to an April 2016 Rural Monitor article, Meeting the Needs of the Whole Child through CATCH, the Coordinated Approach To Child Health (CATCH) program is very adaptable to a rural setting and can be modified to support the needs of both the school and the local population. This program focuses on creating healthy behaviors in children by enabling them to identify nutritious foods and to increase their time spent engaging in physical activity. This program has been successfully established in several rural settings. For example, the CATCH Early Childhood Pre-K program in Illinois, which is featured in the Rural Monitor article, provides a curriculum that includes stories, games, puzzles, and equipment to encourage healthy food choices and physical activity in preschool children. The Coast to Cascades C.H.E.F. (Culinary Health Education and Fitness) program is a rural program that engaged many community partners including school districts, healthcare organizations, and public health departments. This program addresses childhood obesity by establishing a fun curriculum of encouraging healthy eating practices, increased physical activity, and culinary education for early childhood education and after school education sites. Brain breaks or brain energizers are short activities in the classroom, and they are a great way for schools to add small amounts of physical activity to the school day without losing valuable educational time with students. There are many health education programs that rural schools can implement to improve students' knowledge of how to maintain their own health. For example, in South Dakota, the Harvest of the Month Program encourages schoolchildren to make healthy eating choices by tasting different fruits and vegetables. Students in the program can sample new foods and are encouraged to make healthy food choices at school and at home. Exposing young children to a variety of nutritious foods in a positive setting will help them improve life-long healthy food behaviors. This Harvest of the Month program is based on a model from Network for a Healthy California and has been implemented in other states as well. CATCH is a popular health education program that teaches health promotion activities during the school day as well as encourage positive behaviors outside of school. It is important for rural schools, teachers, and coaches to take an active role in preventing injuries during gym classes, school practices, and during school sporting events. Teachers and coaches can educate student athletes and parents about the dangers of head injuries and can teach and promote safe playing techniques. More information is available from the Centers for Disease Control and Prevention regarding brain injury safety while playing sports and monitoring the health of student athletes who have symptoms of a concussion. According to the article, Rural Schools, Medical Facilities Partner for Athletic Training Services, some rural schools in Montana and Ohio are receiving free athletic training services from hospital staff. In exchange, the hospital receives exclusive marketing and sponsorship rights to the school's sporting events. Since many rural schools do not have an athletic trainer, this is an opportunity for injured student athletes to be examined and given instructions on exercises for rehabilitation. Several examples of wellness programs for children can be found in RHIhub’s Models and Innovations under the topic of Wellness, health promotion, and disease prevention and narrowing by topic to Children and youth. Population health is defined as the health outcomes of a group of individuals, such as the residents of a specific rural community. Schools can promote population health by providing health promotion and disease prevention education to their students, staff, parents and other family members. The prevention of obesity and diabetes can have an impact on the whole community's health and vitality. Schools can also partner with health departments, businesses, and community groups to support physical activity programs by allowing community members to use school gymnasiums and playgrounds when school is not in session. In small, rural communities where funding for gymnasiums, exercise equipment, and playground equipment is limited, it is important for community organizations to work together to provide opportunities for physical activity. Rural schools can motivate staff, students and community members to increase physical activity by creating walking clubs, running clubs, or other opportunities for group exercise. Rural schools could also provide health fairs and wellness days for staff and students to gain awareness of health issues and inspire individuals to take an active role in their healthcare. In looking at the health of the community long-term, many rural schools realize the need to expose students to healthcare careers, in hopes of “growing their own” healthcare providers that can care for the community's citizens down the road. To do this, many schools partner with Area Health Education Centers (AHECs) which provide health career education programs for students. The National AHEC Organization provides a directory of contact information for AHECs by state. The Federal Office of Rural Health Policy offers the Rural Health Care Services Outreach grant program. This program supports collaborative projects that demonstrate effective models of outreach and service delivery in rural communities. Funding can be used to address school-based health services including health promotion and disease prevention activities. Many schools rely on a mix of public, private, and nonprofit funding to support a school-based health center (SBHC). According to the 2013-2014 School-Based Health Alliance report, more than half of SBHCs in the US receive funding from the federal government. Top sources include HRSA's SBHC Capital Program, HRSA's Service Area Competition Funding, and Title X Family Planning funding. Private foundations contributed financial support to 40% of SBHCs. Also, the majority of SBHCs receive state dollars for operation. States can direct funds to SBHCs from various sources including the general fund, taxes, and the federal Maternal and Child Health Block Grant. Other funding programs for school-based health may be found on RHIhub's list of funding opportunities related to schools, which includes federal, state, and private foundation funding opportunities. Information regarding the sustainability of grant-funded school programs can be found in the Planning for Sustainability module of the Rural Community Health Toolkit and the Sustainability Planning Tools page. Adverse childhood experiences can have great impacts on children's growth and development. The National Survey of Children's Health 2011-2012 found that rural children were more likely than their urban peers to have experienced ACEs such as divorce, a family member who has mental illness or a substance abuse problem, witnessing domestic violence, or had an incarcerated parent. ACEs can cause mental, emotional, and physical health issues for impacted children, and are likely to impact their health as adults. The Rural Monitor article, Confronting Adverse Childhood Experiences to Improve Rural Kids' Lifelong Health, discusses the Compassionate Schools initiative that was implemented in Buncombe County, North Carolina. The program works to recognize signs of trauma in children and respond to their needs. In addition, the program teaches students skills such as resiliency and self-regulation. The article also details the Fostering Futures program of Menominee Nation in Wisconsin, a collaborative effort that involved numerous agencies, including the local school district, to address and prevent ACEs. The program has increased behavioral health visits, decreased school suspensions, and increased graduation rates. For additional information about the program, see Fostering Futures in Menominee Nation in RHIhub's Models and Innovations section. For additional information and resources, see a summary of the December 2017 Rural Health Chat, Adverse Childhood Experiences in Rural Areas.